Dean Sue Wasiolek is as much a part of student life at Duke as the East-West Shuttle and Sam’s Quik Shop. She is Den Mother for the student body (aka “Dean of Students”), a role she held when I was a student a “few” years ago. 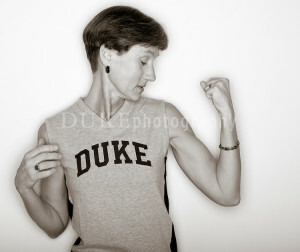 My daughter Abigail and I know her these days as a fellow die-hard Duke football fan. While we’ve been serious only during the Cutcliffe era, Dean Sue’s attended every game, home and away for 30+ years (except one, missed to accompany her father to his naval reunion) – through thick and a truckload of thin. 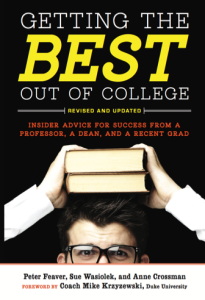 Naturally, I was intrigued when I discovered that she was one of 3 co-authors of Getting the Best out of College, which offers up practical advice to incoming students about how to get the most out of their college years. The basic premise is that the choice of college is less important than the choices that are made during college – so here’s what you need to do to help you make those wise choices. I approached the book seeking useful advice I could share with Abigail, just a few years away from her college experience. I unexpectedly found a lot of wisdom that resonated with ME, quite a few years removed from Duke, but still very much aware that I’ve got much to learn about life. Life is a beta, after all. Most of us (myself included) don’t enjoy conflict. Thankfully(? ), email is there for us, letting us vent our frustrations with our co-workers or customers without actually facing them in person. We all do this even though we know it’s DUMB. Apparently, students tend to make this same mistake – both with their roommates and their professors. Dean Sue: “If the problem is too small to talk about it in person, ignore it; if it is too big to ignore, it is too big for email and requires a face to face conversation.” A GREAT way to think about it. Incoming freshmen at today’s colleges complete a typically extensive ‘self-questionnaire’, describing themselves and their personal habits in gory detail. Apparently a fairly extensive science has developed around making compatible roommate matches using this information. Unfortunately, some kids (or their parents) represent themselves as they WISH they would be (“Yes, I like to study diligently every night”) or try to game the system (like the smoker who said she didn’t smoke because she thought being matched with another smoker would create too much smoke for one small dorm room). Naturally, this creates havoc in the high-risk ‘freshman roommate’ dynamic. How often do we as adults do the very same thing? We think we’re ’supposed to’ be a doctor/lawyer/accountant, work at a big company, live in the suburbs, etc… whether or not that’s who we truly are. No doubt that we can all live more meaningful, engaged lives if we do things we are passionate about and truly enjoy – because they fit who we really are. 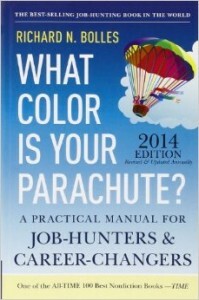 I highly recommend What Color is Your Parachute if you’d like a little guidance. I’d seen that book forever, but only did it recently, to help me think through a mid-career adjustment. Being away from home (for REAL!) for the first time is a really exciting/scary thing for kids, so they naturally seek the comfort of others. Dean Sue points out that for many it’s the people who they live near or meet in the first two weeks of school, when nobody knows anybody. This can certainly work out for some (my freshman year roommate is my best friend to this day), but not always (esp. for those who lied on their personal questionnaires!). 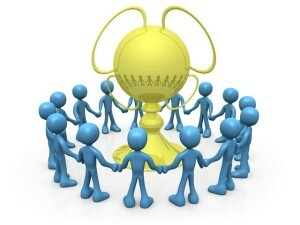 She advises that it’s best to be more thoughtful about who you hang out with, as “… the type of people you spend the majority of your time with – downtime, uptime, or anytime – is quite simply the type of person you will become.” This means pursuing people with values you respect and who are ‘winners’ in ways you want to win. To broaden your worldview, she challenges the freshman to explore activities a bit out of their comfort zone, with people not necessarily like them, e.g. international students with non-international students. I find that in my work-life, I’ve often let a similar ‘proximity’ dynamic dictate who become my close colleagues. I naturally tend to become close to those that sit close to me, are in my same department, or are working on a similar project. It would be much better to try to create my own personal network in a more thoughtful way, seeking opportunities to connect with people that I sense have it going on, but aren’t necessarily ’nearby’. My process for picking courses was to first identify the next logical courses in my major, and then filling in the gaps with ‘interesting’ classes that fit in the remaining time slots. Per Dean Sue, this is precisely the WRONG way to do it. Instead, the top priority should be to seek out the courses of the most highly regarded professors or courses. (Dean Sue, why didn’t you tell me this before?) The rationale: “Beyond your own satisfaction for having gotten the most bang for your buck in your college experience, the overall goal in building a narrative via your course selection is to present a thoughtful, well-educated, well-rounded individual to future employers.” The student is then to prepare for interviews by developing a narrative with themes, personalized to them, that aligns to their transcript, extracurricular, and summer activities. The more interesting the ‘story’, the more interesting the student/job candidate. For those of us attending the ‘college of life’, this suggests we each develop our own personal brand / elevator speech, that says who we are, NOT defined exclusively by the job roles we have. Borrowing another concept from the ‘What Color’ book, we need to know the tasks we like to do that underpin the job roles we’ve most enjoyed. For me, that means always being exposed to new things and people, and collaborating with others to analyze the information towards developing insights to put into practice towards some meaningful objective. I’ve done those things in a number of roles in the technology space – for vendors as well as consumers of technology. 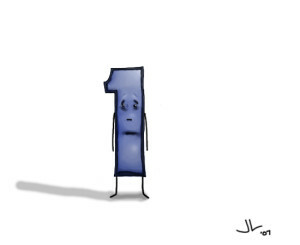 Your story is surely different, but the important thing is to have one! Seek to REALLY connect with a few professors (aka ‘mentors’). The chapter on how to engage with professors, and the benefits of doing so, reads like a handbook for seeking mentors. You can’t have but a few; look for ways to connect and let the relationship develop over time before you ask for things; respect their time; connect in person, not via email, on and on. Most professors/people WANT to help others, but especially those who realize it’s a two-way street, and professionally manage the relationship. Per Dean Sue, despite the presence of tutors, study groups, and seemingly endless campus resources, many students who encounter difficulties in a class try to just ‘work harder’ and go it alone. Bad move! In the work world, I’ve observed the same phenomena: because of the fear of admitting the need for help, the desire to ‘man up’ and take ownership, or the fear of getting a bad review because you ‘couldn’t handle the job’, so often people try to go it alone. I recall once hearing a manager of an obviously failing project proclaim that he just had a ‘hands-off’ leadership style, instead of simply acknowledging that things had gotten out of control and he needed a hand. I’ve found that the act of asking for help can really help me connect to others. It’s almost as if we all know that we’re not perfect, but nobody’s brave enough to admit it. When someone does, the pressure is off for everyone. College is about much more than the classroom. The book has a chapter dedicated to the unique needs of international students. Apparently, unlike American students who know that learning to drink is one of the key ‘classes’ at college, many who come to American universities from abroad “… view the college experience as purely academic, and see the extracurricular side as frivolous.” Dean Sue reminds us that a great deal of the education in college occurs OUTSIDE the classroom. In the work context, I’ve heard this notion described as HOW you do what you do is often more important than WHAT you do. For left-brainers like me, this can be a hard message to really internalize. Shouldn’t the work product itself be enough? Quite simply, NO. Dean Sue encourages us to see the whole world as a classroom, so live it up! 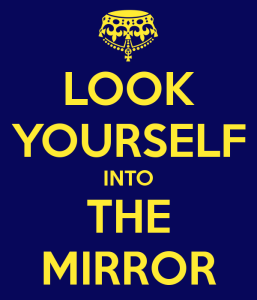 College shouldn’t be THAT stressful – if things are rough, first look in the mirror. Borrowing a bit from George Bernard Shaw, I’ve always felt that college is wasted on the young. I was surely too immature to appreciate all the opportunities that college offered and cope with all the new things flying at me without a goodly amount of stress. That being said, there is a point where stress becomes unhealthy and a student begins to consider transferring to another school. She acknowledges that there can certainly be instances where transferring makes sense, like the student desires to study something not found at their current university. But that’s the exception. This is great advice for us living in the real world. It can seem so easy to flee a job, marriage, school for your kids, etc… when times get tough. Dean Sue is suggesting we take ownership of the situation, and see how WE can change to make things better. This is an empowering message, because it suggests that outcomes are largely in our own hands, not that of the fates. Be purposeful – college (and life) will be over before you know it! Thanks Dean Sue, for joining with two of your colleagues to take the wisdom you’ve shared directly with scores of students over the years, and make it available to a wider audience through the book. The bottom line to me is to NOT sleep walk through life, be it your college age years or beyond. Consider all of life’s experiences as an opportunity to learn, and to connect with people. Go Duke! This entry was posted in Communications by pmiller55. Bookmark the permalink.